Since 1979, Old Savannah Tours has been providing visitors to Savannah the best choice of trolley tours. Today we are the largest Savannah-owned and operated company. Come enjoy the Southern charm of Savannah. Explore the cobblestone streets and journey back in time with Old Savannah Tours. Located at the old Central of Georgia Railway Savannah Shops and Terminal Facilities, Georgia State Railroad Museum is a stunning National Historic Landmark that is part of a National Historic Landmark District. Enjoy a close-up view of the fully operational turntable, learn about the many historic railcars and rolling stock on display, and experience the handcar with the help of a knowledgeable and friendly historic interpreter. Check the schedule for train ride dates and times, which rotate between the No. 30 steam locomotive built in 1913, and the 'modern' No. 119 diesel locomotive built in 1947... Either way you won't want to miss a ride into Savannah - and the country's - past. Savannah’s heart since the 1700s. Centuries ago, Savannahians gathered here for their groceries, services and other goods, too. The Market thrived even after two fires, survived the Civil War and weathered Savannah’s great 1896 hurricane—only to fall into disrepair as the population and commerce spread out. Today, thanks to Savannah’s preservation movement, City Market is home to some of the Historic District’s most popular restaurants, art galleries, and other shops. They fill the historic storefronts and warehouses and spill into the shaded pedestrian courtyard between historic Ellis and Franklin Squares. There are many choices for your next meeting spot. But none like gracious Savannah, and her award-winning International Trade & Convention Center. From heads of state to the nation’s fastest growing companies, our many satisfied customers share one common element: success. Why? Outstanding catering and customer service. Superb functionality. Free downtown transportation. Over 12,000 first-class hotel rooms. And the beauty and excitement of Savannah, one of Travel+Leisure’s Top Ten Places to Visit in North America. The Coastal Georgia Center opened in the mid 1980’s and an expansion project completed in 2003 has insured that our graduate programs continue to grow. The Coastal Georgia Center is operated by Georgia Southern University, in partnership with Armstrong State University and Savannah State University. We provide meeting space, continuing education classes, graduate courses, distance learning, and professional development classes. The center was planned and constructed by meeting planners, so that businesses and students alike could have every modern convenience during a meeting or in the classroom. This 2-story facility is one of the most up-to-date, providing satellite transmission, computer labs, distance education, wireless internet access in every room, and laptop computers available. 301 Martin Luther King Jr. Blvd. 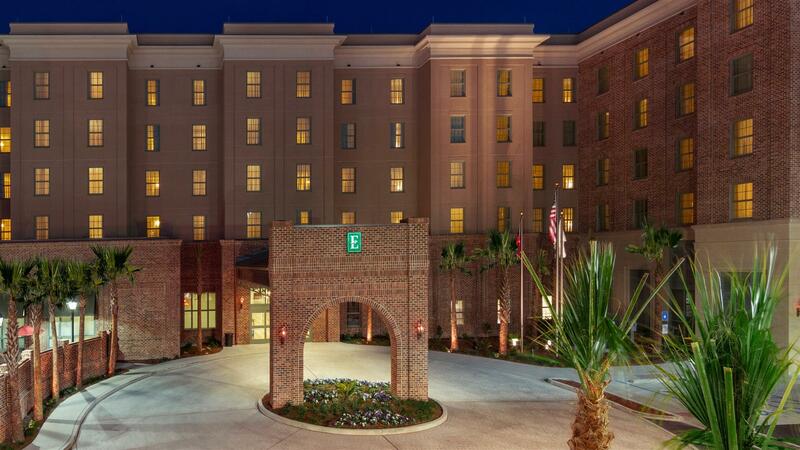 Where History meets luxury ~ Embassy Suites Savannah Historic District. Our upscale, all-suite Historic District Savannah hotel offers an ideal location in the heart of historic downtown, just 12 miles east of Savannah Hilton Head International Airport and Tybee Island Beach. With 6,000 sq. ft. of flexible meeting space we are a superb choice for your next event. From a small intimate meeting to a convention packed full of energy let our experienced staff help you plan every detail from beginning to end! 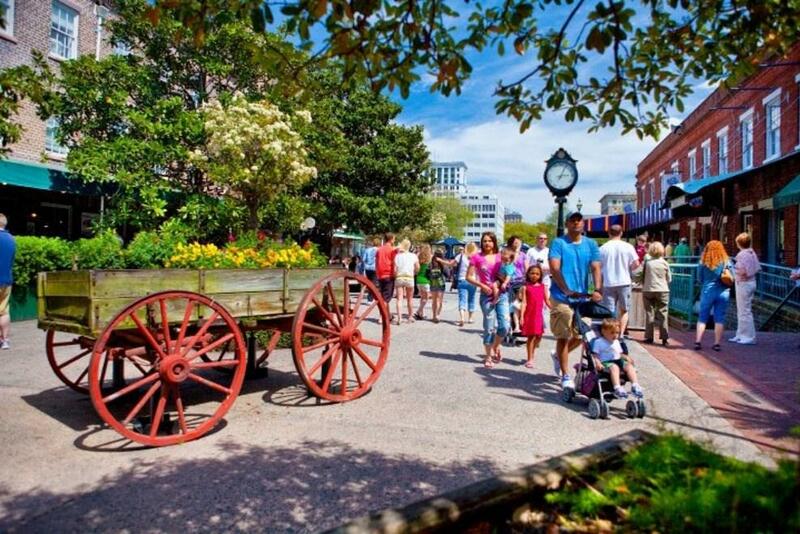 Your attendees can visit nearby attractions that are just steps away including River Street, City Market and ever iconic Forsyth Park in their free time. Enjoy the day with some boutique shopping on Historic Broughton Street, dining on the waterfront and strolling thru the majestic tree-lined squares in the largest National Historic Landmark District. Explore the Savannah History Museum and Visitor Center, The Georgia Railroad Museum and the Savannah Children’s Museum just a block away. The hotel is also adjacent to the new Savannah College of Art and Design Museum of Art. Just steps from the Ships of the Sea Museum and so many more! This award-winning Savannah Historic District hotel offers a variety of stylish two-room suites providing all the comforts of home. Relax in our spacious suites with a separate living area and separate bedrooms. Prepare a snack with the in-room microwave and refrigerator and sleep well in the sumptuous bed. Start your day with a free cooked-to-order breakfast, and in the evening unwind with a few cocktails and light snacks at our complimentary Evening Reception. Take a quick lunch break with our on-site Rue To Go Market offering fresh salads, sandwiches and lattes! Fast and French ~ delicious! Join us for dinner at 39 Rue de Jean, our on-site restaurant. *Service of alcohol subject to state and local laws. Must be of legal drinking age. From a family reunion to a mid-size meeting or a beautiful southern wedding reception, you can count on our exceptional planning team to help create and coordinate every aspect of your next event. We have over 5,300 sq. ft. of banquet facilities along with business services and recreational amenities to provide you with everything you need for success. Our location in the historic district of colonial Savannah provides attendees a chance to step back in history during their free time. Impress your meeting delegates with delicious refreshments or delight your party with an elegantly prepared meal. We'll be happy to assist you with all your catering, A/V equipment and guest room needs so you can focus on the event. Keep up with your healthy lifestyle in our well-equipped fitness center, then cool off in the sparkling outdoor pool. In the evening unwind and reminisce about the day’s adventures with your friends and family by our poolside fire pit. If Business brings you to Savannah you will appreciate our 24-hour business center as well as proximity to many corporate offices including Gulfstream Aerospace, International Paper and Flight Safety International. We are also just steps from the Georgia Coastal Center, Savannah Civic Center and just 3 miles from the Savannah International Trade and Convention Center. With over 5,300 square feet of meeting space and on-site 39 Rue De Jean Restaurant and Catering Team, we will be sure to impress your attendees.